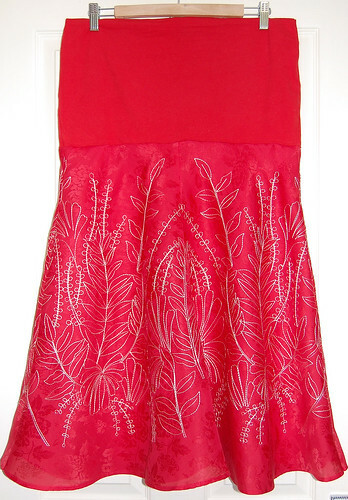 Red silk recycled maternity skirt, originally uploaded by indiaeden. I was given this gorgeous red silk skirt by a lovely friend a month or so ago after she saw my other recycled maternity skirt. I finally got around to cutting into it today. This was a super simple upcycle, cos all I had to do was cut a few inches off each side of the skirt to make it fit under my bump, then re do those side seams, and this time I used a ready made belly band as the stretchy panel. Whole thing took about 15 mins, and was completely free! Now I'm just lusting after these shoes, or maybe these to go with it...neither are very practical pregnancy shoes, so in reality I'll probably stick to flats.